Before John Palatiello became the first MAPPS Executive Director in 1987, he provided other consulting services to the association. 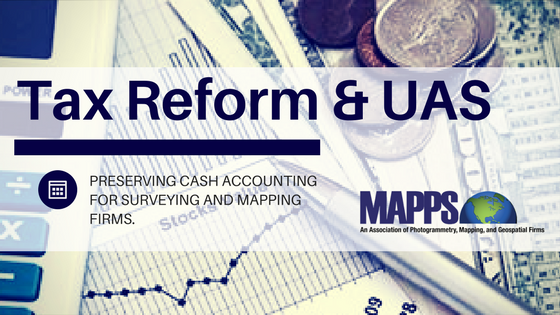 When Congress considered the last major reform tax bill, in 1986, MAPPS worked with a coalition in the A/E community to preserve cash based accounting for certain professional service firms. Language preserving cash(versus accrual) was an option that was proposed to included in the 1986 Act. We won. Congress specifically mentioned surveying and mapping as being among the professional service firms that could continue to use cash accounting for tax purposes. To this day, that is reflected in tax regulations. At that time, MAPPS was involved in a study that found that as much as 1/3 of an A/E firm's (including surveying and mapping firms) revenue was in accounts receivable at any point in time. If that point in time was the end of the firm's tax year, and the firm was legally required to use accrual accounting, then the firm would have to pay tax on income – 1/3 of its annual revenue – not yet realized, and in some cases, income that would never be realized. This was viewed as a great burden on small A/E firms, including those in surveying and mapping. This argument helped save the day for A/E/S/M firms' ability to continue to use cash accounting in the 1986 tax reform bill that became law. In recent years, MAPPS (John M. Palatiello and John "JB" Byrd) continued to keep Congress informed of this important tax provision. In a victory for MAPPS members, The Tax Cuts and Jobs Act, H.R. 1, the tax reform and reduction bill introduced in Congress last week, makes no changes to accounting rules affecting surveying and mapping firms, and thus preserves cash accounting. MAPPS Executive Director John Palatiello last week joined Secretary of Transportation Elaine Chao, Federal Aviation Administrator Michael Huerta, and other officials at the unveiling of a pilot program of projects, pursuant to President Trump's announcement to test relaxed regulations governing the use of unmanned aircraft systems (UAS), also known as drones. At the Drone Integration Pilot Program launch, Michael Kratsios, Deputy Assistant to the President in the Office of Science and Technology Policy in the White House, cited surveyors among the key stakeholders who will benefit from the program. The program will award grants to state, local, and tribal governments who partner with private sector entities, such as UAS operators or manufacturers, to accelerate safe UAS integration by testing operations such as flying over people, beyond visual line of site, and in other situations currently prohibited by regulation in order to gain experience and gather data on new, relaxed regulations. See the program information for dates, deadlines and further information.